There’s no question about the health benefits of sprouts. Sprouts are extremely nutritious, easy to blend into any salad, soup or sandwich, and pack a serious nutritional punch. Of course, when you hear the word “sprouts” you mind might jump back to horrible memories of being a kid, faced with a plate of steamed Brussels sprouts and your parents denying dessert until they’re all gone. Or maybe that’s just me. Sprouts come in all different forms, far beyond just Brussels sprouts. They are low in calories and easily add protein, vitamins, minerals, fiber, and antioxidants to virtually any meal. Alfalfa sprouts: A good source of a multitude of vitamins (A–F, and K) and fatty acids. Wheatgrass sprouts: Wheatgrass sprouts are high in vitamins B, C, and E. Also high in potassium, fiber, protein, calcium, iron, thiamin, riboflavin, niacin, folate, and zinc, and contains vitamins A, D, and K.
Mung bean sprouts: Contains 3 g of protein per serving, plus fiber, and vitamins A and C.
Lentil sprouts: A good source of protein and can conveniently be eaten raw. 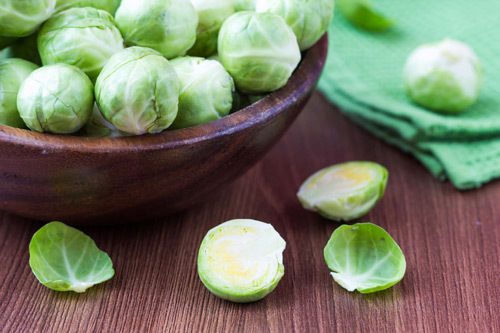 Brussels sprouts: One cup has just 56 calories, but more than 240 percent of your daily requirements for vitamin K and nearly 130 percent of vitamin C. It’s also a good source of fiber, manganese, potassium, choline, B vitamins, and antioxidants. Those are just a handful of the sprouts you can get; there are many more with just as many benefits. Let’s take a look at some other health benefits you can get from eating sprouts. 1. They have way more vitamins: In some varieties, vitamins are increased by as much as 20 times during the sprouting process, while some go even higher. Vitamin B1 in mung beans increases by 285% in sprout form; B2 goes up 515%! 2. They are higher in enzyme content: This might be surprising, but sprouts feature an estimated 100 times more enzymes than fruits and vegetables! So what does that mean for you? It means two things: a) your body can extract and use a higher percentage of the nutrients supplied from sprouts, and b) sprouts help you to better extract nutrients from other foods you eat along with them. A two-for-one digestive punch! 3. They have a high bioavailability: As important as it is to have a nutritious diet, different sources provide various levels of bioavailability—that is, the process and ease at which your body can absorb and use nutrients. Sprouts have very high bioavailability, meaning very little of the nutrients in them go to waste. 4. They boost essential fatty acids: The Standard American Diet does not have a very good variety of essential fatty acids, and sprouts are a perfect way to improve the balance. They are rich in a variety of fatty acids, including omega-3 (particularly Brussels sprouts). 5. They’re an easy source of fiber: Another nutrient many Americans are short on is fiber. Sprouts are an easy way to add fiber to virtually any meal, which can improve heart health and digestion. 6. They can decrease blood pressure: In a test on rats, researchers found spouted buckwheat extracts was able to lower systolic blood pressure and protect endothelial cells that line your arteries and veins. 7. They can help battle diabetes: A small study looking at men and women affected by pre-diabetes and type-2 diabetes showed sprouted brown rice can improve fasted glucose and cholesterol levels. These findings suggest it may help control blood sugar. 8. They might help fight cardiovascular disease and lower the risk of heart attack: Brown sprouted rice can help boost “good” HDL cholesterol, lowering the risk for arterial blockages. However, the results were found using mice, so more work needs to be completed in this area. 9. They can protect your liver: The liver is one of the most important organs for your overall health, and sprouted buckwheat may help it stay on point. In mice studies, sprouted buckwheat was shown to reduce fatty deposits on the liver. Fatty deposits on the liver can lead to a condition called “fatty liver disease,” which is very similar to cirrhosis brought on by heavy alcohol consumption and can bring on some serious health problems. Buckwheat sprouted for 48 hours and taken for eight weeks substantially reduced fatty liver in mice. 10. They can protect against anemia: Folate is found in large amounts in many sprout varieties. It’s a very important nutrient that helps the body produce DNA, amino acids, and red blood cells. One cup of mung bean sprouts has 16% of the recommended daily intake of folate, while soybeans have more than 30%. A higher red blood cell count can help stave off anemia. 11. They can give you stronger, fuller hair: Vitamins A and C both help promote strong hair. Vitamin C can aid in hair growth and keep it from becoming brittle. It might also help prevent scalp conditions like alopecia. Vitamin A can stimulate follicles to encourage them to produce more hair. Additionally, not getting enough vitamin A can lead to dry scalp and hair loss. 12. They have anti-dandruff properties: Selenium found in many sprout varieties can help kill the fungus that dries the scalp and leads to dandruff. If dandruff is already present, it can help treat the symptoms. 13. They can have an alkalizing effect on the body: Sprouts can help balance a diet high in acidity. High acidity can lead to inflammation, making you more susceptible to illness and other chronic conditions. 14. They’re an easy way to add nutrition: Aside from the specific benefits sprouts might offer, they are an easy and accessible way to improve your overall nutrition. They can be added to any meal to boost the nutritional value and provide nutrients you might otherwise miss. 15. They’re super cheap: Eating healthy can be expensive, but sprouts are a definite exception to that rule. Plus you don’t need to eat a lot of them to reap the rewards. Brussels sprouts can be prepared in delicious ways and pack a very impressive nutritional punch; however, they are not the only show in town. Sprouts from a number of sources offer serious nutritional value and should not be overlooked when finding ways to improve your diet. Busch, S., “What Are the Health Benefits of Bean Sprouts?” Livestrong web site, May 4, 2015; http://www.livestrong.com/article/390504-what-are-the-health-benefits-of-bean-sprouts/, last accessed March 2, 2016. “Health Benefits of Sprouted Grains,” Whole Grains Council web site; http://wholegrainscouncil.org/whole-grains-101/health-benefits-of-sprouted-grains, last accessed March 2, 2016. Cook, M., “10 Reasons to Eat Sprouts,” Care 2 web site, April 21, 2012; http://www.care2.com/greenliving/10-reasons-to-eat-sprouts.html, last accessed March 2, 2016.